← Tweet tweet – it’s all about birds! There are many great initiatives and project in Glasgow. One of them is quite local to me, the Battlefield Community Project which looks after a community garden in the heart of Battlefield which is in the Southside of Glasgow. This weekend, Urban Roots (also a Southside organisation) had set up a weekend of creating living willow structures, and I’d been looking forward to this for quite a while. I’m quite partial to anything to do with wood, and it was definitely on my wish list to learn a thing or two about willow. At the end of the summer, when the Forgotten Island disappeared, there were piles of living willow going for free and I was tempted to make use of some, but then thought better of it, not knowing much about willow or how to look after it. Today, the 10 people or so who took part in the workshop, created a willow dome and tunnel which has added a children’s corner and play area to the community garden. I tested it out with my kids later in the day and it definitely got the thumbs up. What I really like about this (apart from the fact that I can walk by and say “I made that!” which is quite a nice thing to be able to say) is that it’s an open space in the middle of a very densely populated part of a city, with no fences, totally open access. It’s quite astonishing what the Battlefield Community Project has managed to do, step by step, to create an oasis with garden space, regular events in the garden and now this wonderful willow den. I didn’t just learn something new which I can use again, but I’m rather pleased that my kids now have this great outdoor play structure available to them in walking distance. And maybe, just maybe, this could be an inspiration for others to do something similar near them. 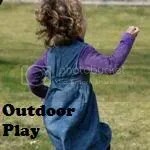 It doesn’t take wide open spaces, woodlands or parks to encourage outdoor play. Sometimes, amazing things are possible in the middle of the city. This entry was posted in Food for Thought and tagged arch, battlefield, battlefield community project, community, den, dome, garden, Glasgow, living willow, urgan roots, willow. Bookmark the permalink. Hi Elaine, I use the “slideshow” option in WordPress after uploading the images I want to use. It just does it to the pictures, it’s quite nifty as it’s so easy. We were playing in the willow den today. My one year old running in and out. My 3 year old took great pleasure in riding her bike into it. Loooking forward to watching it grow.